This article is about a district in Atlanta. For the mixed-use development in this district, see Buckhead Atlanta. For other uses, see Buckhead (disambiguation). In 1838, Henry Irby purchased 202 1/2 acres surrounding the present intersection of Peachtree, Roswell, and West Paces Ferry roads from Daniel Johnson for $650. Irby subsequently established a general store and tavern at the northwest corner of the intersection. The name "Buckhead" comes from a story that Irby killed a large buck deer and placed the head in a prominent location. Prior to this, the settlement was called Irbyville. By the late 1800s, Buckhead had become a rural vacation spot for wealthy Atlantans. In the 1890s, Buckhead was rechristened Atlanta Heights but by the 1920s it was again "Buckhead". Buckhead remained dominated by country estates until after World War I, when many of Atlanta's wealthy began building mansions among the area's rolling hills. Despite the stock market crash of 1929, lavish mansions were still constructed in Buckhead throughout the Great Depression. In 1930, Henry Aaron Alexander built one of the largest homes on Peachtree Road, a 15,000-square-foot (1,400 m2) house with 33 rooms and 13 bathrooms. The community was annexed by Atlanta in 1952, following an earlier attempt by Mayor William B. Hartsfield in 1946 that was voted down by residents. Buckhead's black neighborhoods, including Johnsontown, Piney Grove, Savagetown and Macedonia Park, were razed beginning in the 1940s. In 1956, an estate known as Joyeuse was chosen as the site for a major shopping center to be known as Lenox Square. The mall was designed by Joe Amisano, an architect who designed many of Atlanta's modernist buildings. When Lenox Square opened in 1959, it was one of the first malls in the country, and the largest shopping center in the Southeastern U.S. Office development soon followed with the construction of Tower Place in 1974. To reverse a downturn in Buckhead Village during the 1980s, minimum parking spot requirements for bars were lifted, which quickly led to it becoming the most dense concentration of bars and clubs in the Atlanta area. Many bars and clubs catered mostly to the black community in the Atlanta area, including Otto's, Cobalt, 112, BAR, World Bar, Lulu's Bait Shack, Mako's, Tongue & Groove, Chaos, John Harvard's Brew House, Paradox, Frequency & Havana Club. The area became renowned as a party spot for Atlanta area rappers and singers, including Outkast, Jazze Pha, Jagged Edge, Usher and Jermaine Dupri, who mentioned the neighborhood's clubs on his song "Welcome to Atlanta." Following the events of the Ray Lewis murder case in Buckhead on the night of the 2000 Super Bowl (held in Atlanta at the Georgia Dome), as well as a series of murders involving the Black Mafia Family, residents sought to ameliorate crime by taking measures to reduce the community's nightlife and re-establish a more residential character. The Buckhead Coalition's president and former Atlanta Mayor Sam Massell, along with councilwoman Mary Norwood were instrumental in persuading the Atlanta City Council to pass a local ordinance to close bars at 2:30 AM rather than 4 AM, and liquor licenses were made more difficult to obtain. Eventually, most of the Buckhead Village nightlife district was acquired for the "Buckhead Atlanta" multi-use project, and many of the former bars and clubs were razed in 2007. In 2008, a newsletter  by the Fulton County Taxpayers Foundation began circulating that proposed the secession of Buckhead into its own city after more than 50 years as part of Atlanta. This came on the heels of neighboring Sandy Springs, which finally became a city in late 2005 after a 30-year struggle to incorporate, and which triggered other such incorporations in metro Atlanta's northern suburbs. Like those cities, the argument to create a city of Buckhead is based on the desire for more local control and lower taxes. Buckhead was originally the central area now called "Buckhead Village". The current usage of the term Buckhead roughly covers the interior of the "V" formed by Interstate 85 on the east and Interstate 75 on the west. Buckhead is bordered by Cumberland and Vinings in Cobb County to the northwest, the city of Sandy Springs to the north, Brookhaven and North Druid Hills in DeKalb County to the east, Midtown Atlanta to the south, and West Midtown to the west. Buckhead comprises most of the neighborhoods of Atlanta's north side, 43 in total. The southernmost area around the Brookwood and Ardmore neighborhoods is sometimes regarded as a separate neighborhood of "South Buckhead". Since at least the 1950s, Buckhead has been known as a district of extreme wealth, with the western and northern neighborhoods being virtually unrivaled in the Southeast. In 2011, The Gadberry Group compiled the list of the 50 wealthiest zip codes in the United States, ranking Buckhead's western zip code (30327) as the second wealthiest zip code in the South (behind Palm Beach's 33480) and the second wealthiest zip code east of California and south of Virginia. The same group reported the average household income at $280,631, with an average household net worth of $1,353,189. These 2011 figures are up from a similar 2005 study that pegged Buckhead as the wealthiest community in the South and the only settlement south of the Washington D.C. suburb of Great Falls, and east of the Phoenix suburb of Paradise Valley to be among the 50 wealthiest communities in the country. However, according to Forbes magazine, (30327) is the ninth-wealthiest zip code in the nation, with a household income in excess of $341,000. The Robb Report magazine has consistently ranked Buckhead one of the nation's "10 Top Affluent Communities" due to "the most beautiful mansions, best shopping, and finest restaurants in the Southeastern United States". 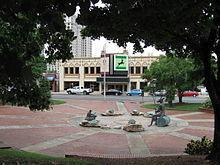 Due to its wealth, Buckhead is sometimes promoted as the "Beverly Hills of the East" or "Beverly Hills of the South" in reference to Beverly Hills, California, an area to which it is often compared. At the heart of Buckhead around the intersections of Lenox, Peachtree and Piedmont Roads, is a shopping district with more than 1,500 retail units where shoppers spend more than $3 billion a year. In addition, Buckhead contains the highest concentration of upscale boutiques in the United States. The majority are located at Lenox Square and Phipps Plaza, sister regional malls located diagonally across from each other at the intersection of Peachtree and Lenox Roads. The malls are home to designer boutiques, mainstream national retailers, as well as six major department stores. This commercial core also has a concentration of "big-box" retailers. The "Buckhead Atlanta" mixed-use development brought even more exclusive boutiques, restaurants, hotels, condos and office space to the heart of Buckhead in 2014. The name of the project was rebranded as 'Buckhead Atlanta'. 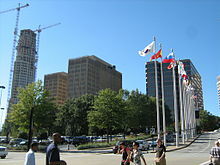 Buckhead is also the location of a large share of Atlanta's diplomatic missions. Consulates in Buckhead include the Consulate-General of Australia and the Australian Trade Commission, the Consulate-General of France and the French Trade Commission, the Consulate-General of Brazil, the Consulate-General of Japan, and the Consulate of Greece. While much of west and north Buckhead is preserved as single-family homes in forested settings, the Peachtree Road corridor has become a major focus of high-rise construction. The first 400-foot (121 m) office tower, Tower Place, opened in 1974. Park Place, built in 1986, was the first 400+ foot (121+ m) condominium building. 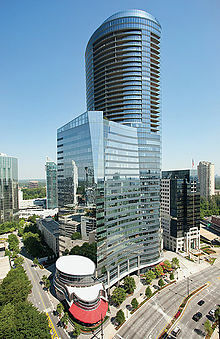 1986 also saw the completion of the 425-foot (129 m), 34-story Atlanta Plaza, then Buckhead's tallest and largest building. In 2000, Park Avenue Condominiums pushed the record to 486 feet (148 m). Since that time, a wave of development has followed. The 660-foot (201 m) Sovereign and 580-foot (177 m) Mandarin Oriental, now renamed the Waldorf-Astoria, were completed in 2008. Many luxury high-rise apartment buildings have been built recently, including the 26-story Post Alexander High Rise in 2014 and the 26-story Skyhouse Buckhead in 2014. Today, Buckhead has over 50 high-rise buildings, almost one-third of the city's total. The area is served by Sutton Middle School and North Atlanta High School. By 2012, due to overall population increases in Buckhead, many schools became increasingly crowded. Brandon Elementary was at 97% capacity, Garden Hills was at 102% capacity, E. Rivers was at 121% capacity, and Sutton was at 150% capacity. 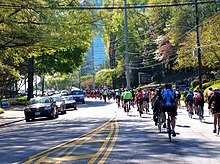 In the round of school zone change proposals in 2012, Ernie Suggs of the Atlanta Journal Constitution said that the zones of Buckhead "remained pretty much intact." There is an area charter school, Atlanta Classical Academy. Local private schools include the Atlanta International School, the Atlanta Speech School, Christ the King School, the Atlanta Girls School, The Galloway School, Holy Spirit Preparatory School, Trinity School, The Lovett School, Pace Academy, and The Westminster Schools. Georgia State University's J. Mack Robinson College of Business' Buckhead Center is located in the heart of Buckhead. This facility houses Georgia State's Executive MBA program. Its "Leadership Speaker Series", which showcases an agenda of executive officers from prestigious, well-known companies is also hosted at their Buckhead Center. The University of Georgia's Terry College of Business Executive Education Center is located in Buckhead. This facility houses the University's executive MBA program and Terry Third Thursday, a lecture series featuring business leaders. There are two branches of the Atlanta-Fulton Public Library System in Buckhead: Northside Branch and Buckhead Branch. The main north-south street of Buckhead is Peachtree Road, which extends south into the heart of the city as Peachtree Street, Atlanta's main street. This name change is significant in that it defines a border between Buckhead and Midtown. The main east-west street is Paces Ferry Road, named for a former ferry that used to cross the Chattahoochee River. Hardy Pace, one of Atlanta's founders, operated the ferry and owned much of what is now Buckhead. In addition to Peachtree and West Paces Ferry Roads, other arterial roads include Piedmont Road (Georgia 237), Roswell Road (Georgia State Route 9), and Northside Parkway. 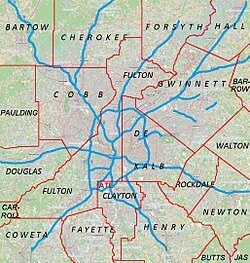 In the early 1990s, after a bitter fight against GDOT by residents, Buckhead was split in two by Georgia 400, a tolled extension of a freeway connecting I-285 to I-85. However, MARTA's Red Line extension was put in the highway's median, providing additional mass transit to Buckhead and Sandy Springs. MARTA operates three stations in Buckhead, the southernmost being Lindbergh Center. Just north of there, the Red and Gold lines split, with the Gold Line's Lenox station at the southwest corner of the Lenox Square parking lot, and the Red Line's Buckhead station on the west side of the malls where Peachtree crosses 400. A free circulator bus called "the buc" (Buckhead Uptown Connection) stops at all three stations. The proposed extension of the Atlanta Streetcar to Buckhead (nicknamed the "Peachtree Streetcar" because it would run along Peachtree Street in Downtown Atlanta and Peachtree Road in Buckhead) would provide street-level service with frequent stops all the way to downtown Atlanta, complementing the existing subway-type MARTA train service for the area. In 2017, the Relay Bike Share program expanded into Buckhead. Three new stations were installed with plans to add more in the future. ^ Garrett, Franklin M. (1969). Atlanta and environs; a chronicle of its people and events. University of Georgia Press. p. 160. ^ Krakow, Kenneth K. (1975). Georgia Place-Names: Their History and Origins (PDF). Macon, GA: Winship Press. p. 27. ISBN 0-915430-00-2. ^ a b "How Buckhead Got Its Name - 90.1 FM WABE". Wabe.org. 28 October 2013. ^ a b "Atlanta, Georgia – History, historic". Buckhead. Retrieved 2011-03-29. ^ a b "Buckhead, Atlanta". Forbes.com. 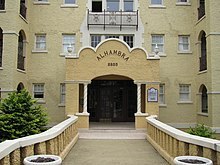 ^ ""atlanta heights" - Google Search". Google.com. ^ "Buckhead Village BAR BRAWL: Critics try to pressure landlords of busy clubs". Thebuckheadalliance.org. ^ Jr, Harry Lyles (2019-01-31). "How Ray Lewis' Super Bowl night in Buckhead changed Atlanta forever". SBNation.com. Retrieved 2019-01-31. ^ "Atlanta, Georgia – Buckhead Neighborhood Map". Buckhead. Retrieved 2011-03-29. ^ "Atlanta Neighborhoods Guide - Find Hotels, Events & More". Atlanta.net. ^ "Buckhead - Atlanta, Georgia - South Buckhead (SOBU)". Buckhead.net. ^ a b "America's Richest Zip Codes 2011". Bloomberg.com. 7 December 2011. ^ "EXPLORING AMERICA'S RICHEST ZIP CODES". Adage.com. ^ "AmeriSuites Buckhead in Atlanta". Worldres.com. Archived from the original on 2015-04-02. Retrieved 11 July 2018. ^ "Mobil Travel Guide 49th Annual Five-Star Awards". Mobil. Archived from the original on 2007-11-21. Retrieved 2007-01-16. ^ "Atlanta–Discover the Possibilities Of the `Athens of the South'". Pn.psychiatryonline.org\accessdate=11 July 2018. ^ "Wayback Machine". 29 August 2006. Archived from the original on 29 August 2006. Retrieved 11 July 2018. ^ "Atlanta, Nashville, New Orleans". Rhythms of the South. Retrieved 2011-03-29. ^ "About Atlanta". Iwf2008.objectwareinc.com. Retrieved 2011-03-29. ^ "Shopping in Atlanta - Frommer's". Frommers.com. ^ USDM.net. "Atlanta Shopping Guide – Atlanta, GA Shopping Malls, Outlets & More". Atlanta.net. Retrieved 2011-03-29. ^ "Oliver Mcmillan - Curbed Atlanta". atlanta.curbed.com. ^ "Home". The Shops Buckhead Atlanta. ^ Karkaria, Urvaksh (2008-09-15). "Piedmont Healthcare launches $525M plan". ^ "Australian Consulate-General and Trade Commission, Atlanta, United States of America Archived 2009-07-28 at the Wayback Machine." Department of Foreign Affairs and Trade. Retrieved on July 28, 2009. ^ "THE CONSULATE GENERAL OF FRANCE IN ATLANTA IS MOVING Archived 2011-07-18 at the Wayback Machine." French Consulate General, Atlanta. Retrieved on September 19, 2010. ^ Williams, Trevor. "It’s Official: Brazil’s Consulate Open in Atlanta[permanent dead link]." Global Atlanta. August 26, 2008. Retrieved on July 28, 2009. ^ "Directions to the Consulate General of Japan in Atlanta." Consulate-General of Japan in Atlanta. Retrieved on July 28, 2009. ^ "Consulate Atlanta, GA Archived 2009-01-25 at the Wayback Machine." Embassy of Greece in Washington, DC. Retrieved on July 28, 2009. ^ Suggs, Ernie. "Buckhead comes out ahead in redistricting battle." Atlanta Journal Constitution. Friday March 16, 2012. Retrieved on March 28, 2012. ^ "Buckhead Branch." Atlanta-Fulton Public Library System. Retrieved on July 28, 2009. ^ "atlanta, ga – Google Maps". Maps.google.com. 1970-01-01. Retrieved 2011-03-29. ^ "Atlanta, Georgia – www.Buckhead, inc. – Buckhead Web". Buckhead. Retrieved 2011-03-29. ^ a b "MARTA – Metropolitan Atlanta Rapid Transit Authority". Itsmarta.com. Retrieved 2011-03-29. ^ "Atlanta Streetcar". Atlantadowntown.com. Archived from the original on 2016-10-04. Retrieved 2016-10-01. ^ "chtree Corridor Partnership – The Modern Streetcar". Peachtreecorridor.org. Archived from the original on January 3, 2011. Retrieved 2011-03-29. ^ "Buckhead will officially launch its bike share program this week". Atlanta.curbed.com. Retrieved 11 July 2018. ^ Andrews, Evelyn (March 30, 2018). "Buckhead bike share ridership is low, but more stations coming". Ajc.com. Retrieved April 21, 2018. 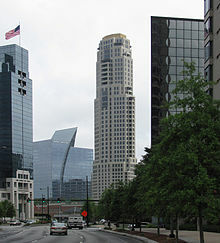 Wikimedia Commons has media related to Buckhead, Atlanta.